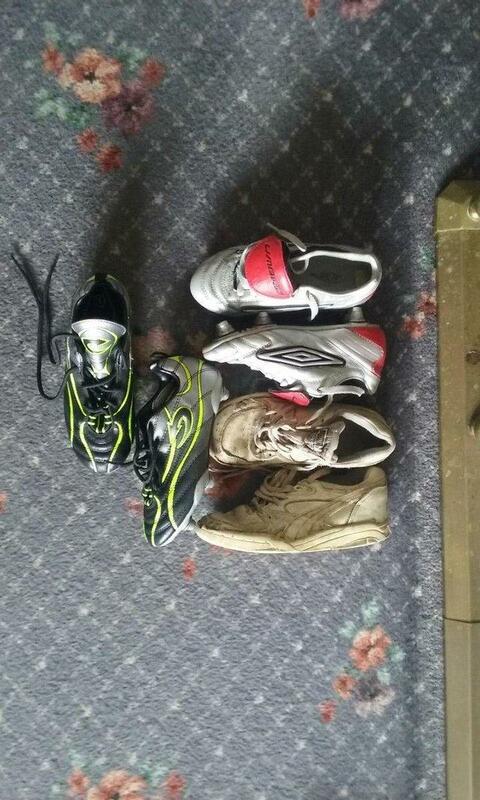 Second hand and used Football Boots for sale. All of the top items on the best UK second hand classified and auction sites in one place. 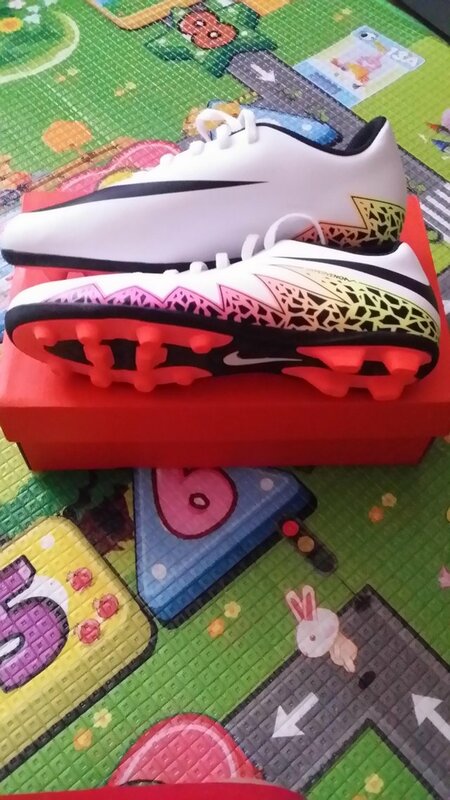 Nike Hypervenon boots size 7.5. 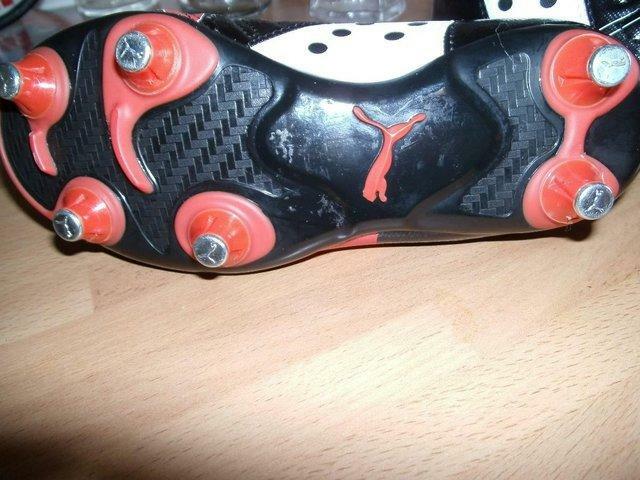 In great condition molded studs. Adidas football boots size 10. Hardly worn.From a pet and smoke free home.Thank you for looking. Nike Hypervenom Phantom ll FG football boots.Volt/Black/Hyper Turquoise. SIZE 5.5 Mens version. Used but good condition. Includes bag Cost Â£120 New. Light usage only used indoors. 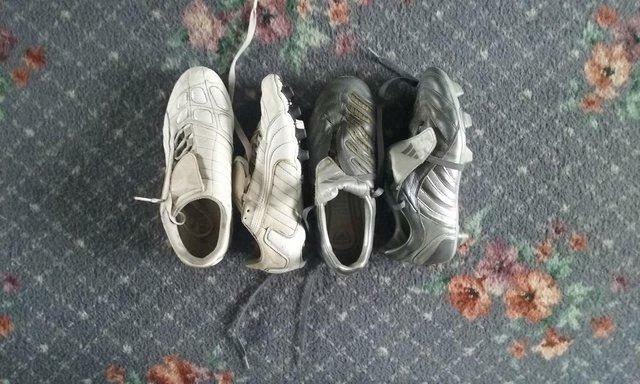 Adidas football boots size 4 still plenty of life left in them . Condition is Used. Dispatched with Royal Mail 2nd Class. Adidas Football Boots size 10 - hardly used (see pics) and in very good condition. Adidas Kids Football Boots Size 13UK. Almost brand new. Only worn twice before outgrown. Nike football boots in silver, brand new, never worn in size 5 + pair of shin pads, Â£25ovno. Collection or can deliver locally. 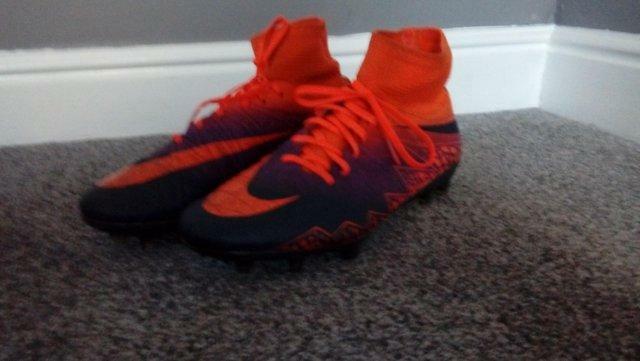 Boys Nike Football Boots, Size 7 (adult) Black/Orange, in good condition. I am in Bromsgrove. Pair of Juan Mata hand signed football boots with COA. Super player for club and country. 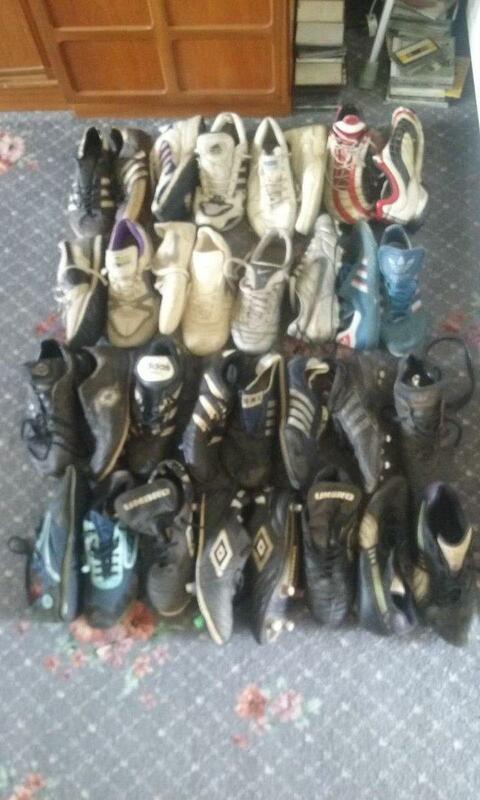 Pair of size 3 football boots in great condition as seen in pictures and ready for use. Boys Adidas All Black Astro Sock Football Boots Size 1. Condition is very good Used condition . Dispatched with Royal Mail 2nd Class. 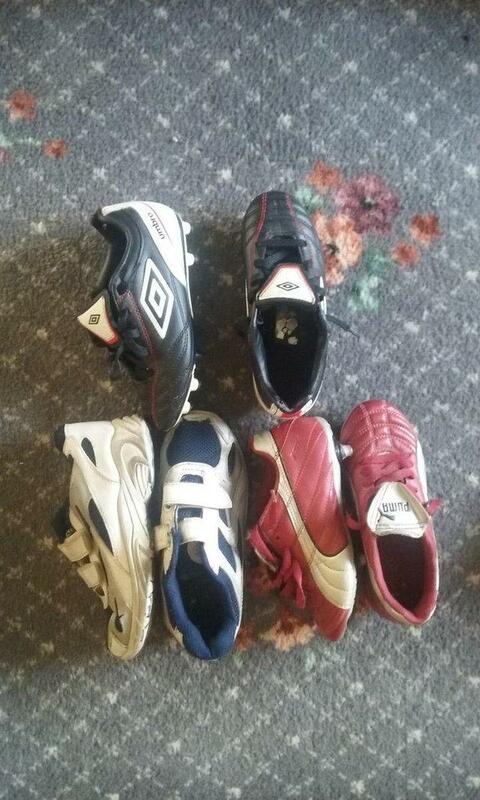 Size 12 addas football boots. Worn once. Adidas Mundial Astro Turf boots mens size 13 (47 2/3), used for a year, good condition, half new price. Bought for Grandson only worn once. These boots have only been tried on for size in the house and never played in, and to all intents and purposes are brand new. Sondico football boots size 5. Only worn a handful of times. Good condition. Adidas X 16.3 Football Boots UK Size 6. Condition is Used. Boots do not come with box Dispatched with eBay delivery – Shutl 2-3 days. Adidas Astro Turf Trainers Kids Size 12Used but good condition as barely worn.See my other items for similar Smoke and pet free homeDispatched with Royal Mail 2nd Class. Puma Kids Football BootsSize: 13A little bit of wear and tear, but in very good condition from a pet and smoke free home. Boys Hi-TEC football Boots Junior Size 10. Hardly used and in excellent condition. Boys Addidas Football Trainers Size 4. Used in A good Condition. Washed . Despatched with Royal Mail 2nd Class within 3 -5 days.Please feel free to ask additional questions .Thanks for looking . 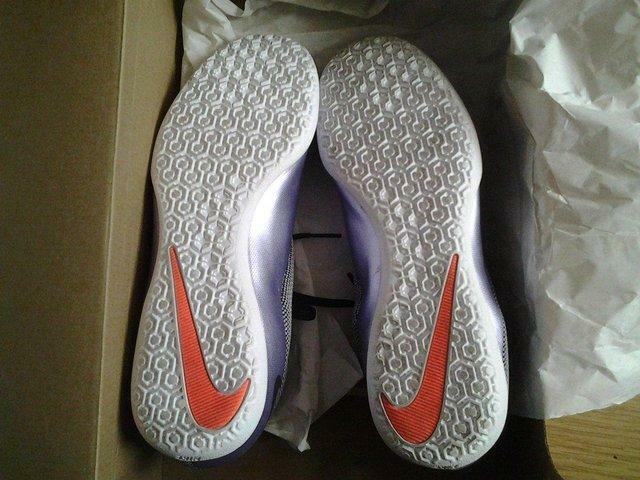 These are Nike Mercurial Victory VTF men's astro turf football boots. They are urban lilac / black in colour. 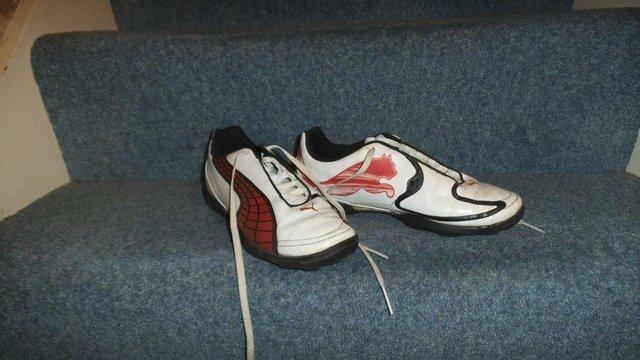 Size 9. Boots only worn once in the house and were too big, no receipt so couldn't return. boys adidas football boots size 12. Condition is Used. Dispatched with Royal Mail 2nd Class. CHILDS ADIDAS FOOTBALL BOOTS. SIZE 10.5. VERY LITTLE USED & IN EXCELLENT CONDITION. white and black Adidas Football Boots, Brand New ,Never Worn, selling as too small now! 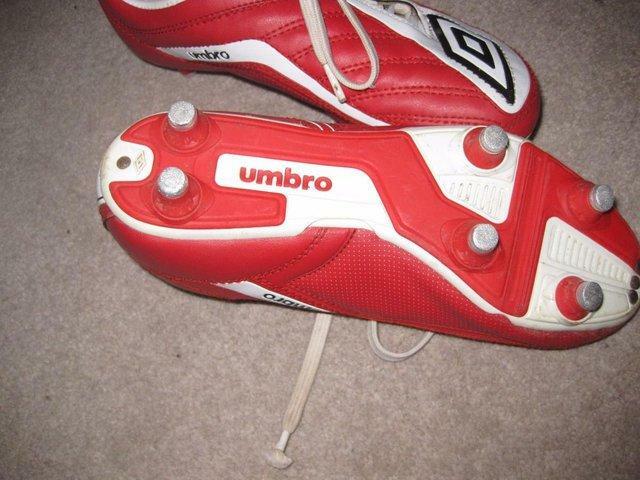 Umbro boots size3,hardly used,very good condition. 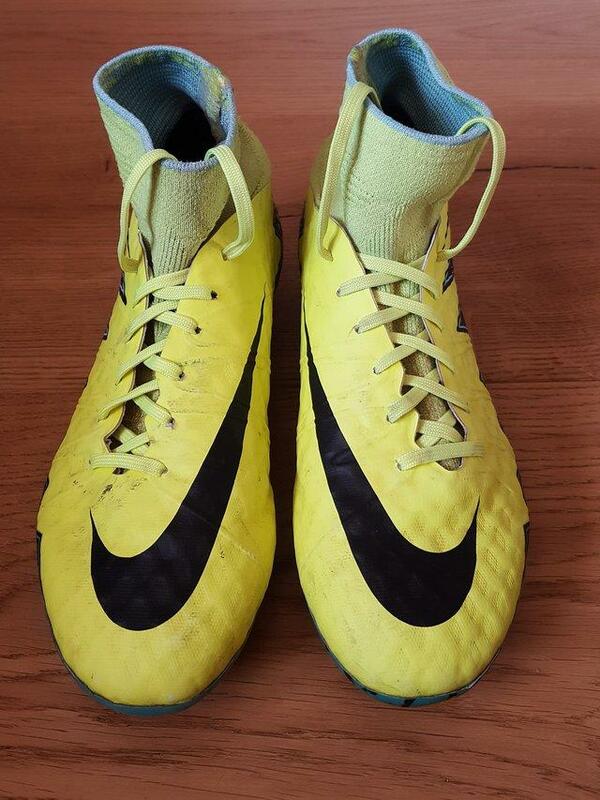 Boys NIKE Magista Astro Turf Football BootsSize : 5.5Colour : Black , yellow , orange Condition: Used condition but still plenty of wear left.From a pet and smoke free home. Football/rugby boots size 5. Perfect condition as only used a handful of times. Have boot bag also but asking for Â£5 for that. Sondico girls football boots. Size 4. In good condition had very little wear. Collection only. In good condition with just a few studs missing. Hi all, Pair of football nike boots, Pink through to purple with a green tick, Size 6, Worn but still have lots more life in them, Pick up from NG19 9HD Will post for Â£3 Thanks for looking.